There’s nothing worse than knowing you have the cable you need, but not knowing exactly where it is — and when you reach into your cable/junk drawer to find what you’re looking for, you get faked out by all the other tangled up cables. NOMAD has solved part of this issue. I guess if you lose the cable, it can’t really be solved, but not having to sort through all your other cables is a relief, because the NOMAD Universal Cable has three of your most used cables built right into it. So, maybe buy a handful of them in case you lose one, and throw every other single-use cable out into the trash where it belongs. I’m about to gush over this thing, so fair warning. I do have one little piece of criticism, but I’ll save that for the end of the section. So let’s get into design. 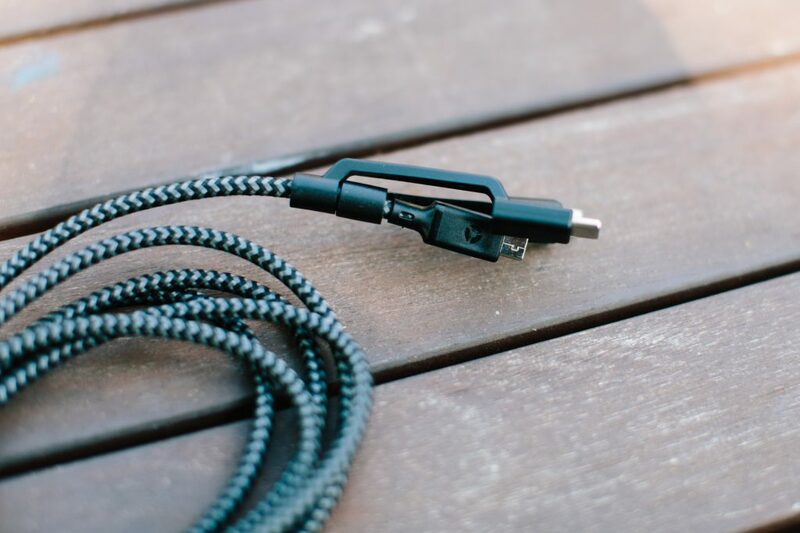 The NOMAD Universal Cable is braided (Braided ballistic nylon cable, according to the NOMAD site), making it sturdier and more rugged than other cables. This accessory is meant for a beating, meant for adventure, and totally up for the challenge of withstanding children getting their hands on it. It is THREE cables in one. No joke. It has Micro USB (for your older tech), Lightning (for your iPhones), and USB-C (for your newer tech). 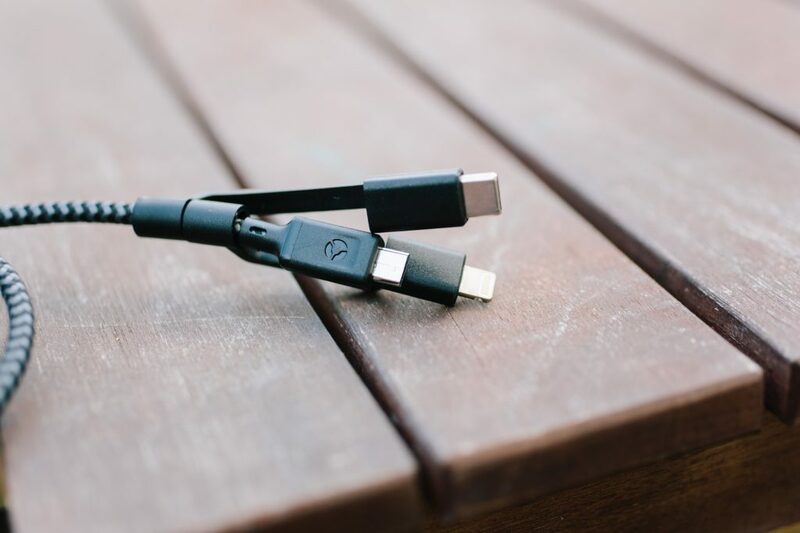 Chances are, if you have a device that was built in past 5 years that needs charging, you won’t need any other cable than this one. It works by having the Micro-USB end fit into the two other heads for use. Basically, you plug the Micro-USB into the Lightning head, or the USB-C head, and you’re good to go. My favorite part of this cable, though, and its design? It has a rugged, reusable rubber zip tie (pic below) attached to keep it all nicely looped together. No more tangles in your drawer if you spend the 5 seconds to use it. 10K Mil-spec flex tested (whatever this means) and Apple MFi approved, meaning it’s up to Apple’s standard and probably won’t fry your device. The Micro-USB tip is a little hard to insert into the other tips. I serious struggle a little bit every time I go to switch them. Fighting it is worth it for the convenience, though, trust me, and my guess as to why they would make it tough is to keep it all very sturdy. 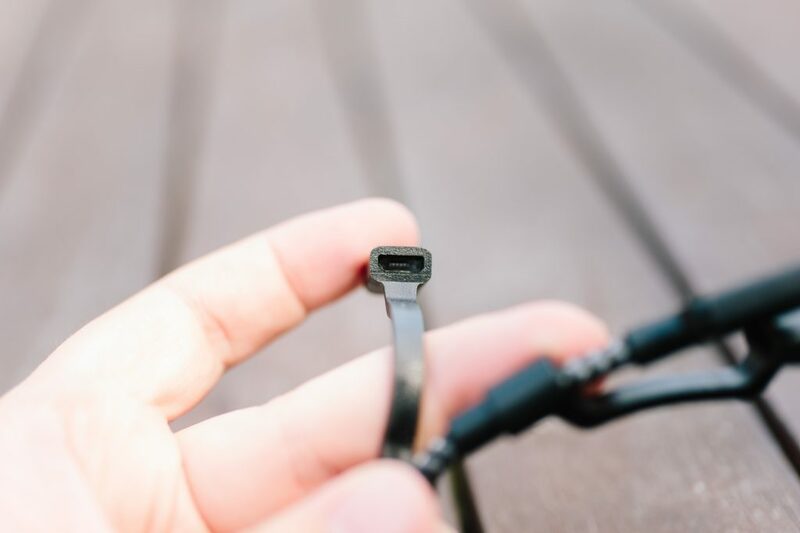 You don’t want the Micro-USB tip to slip out of the other two options during use, so you have to make it tighter. Other than that, this cable is incredible. 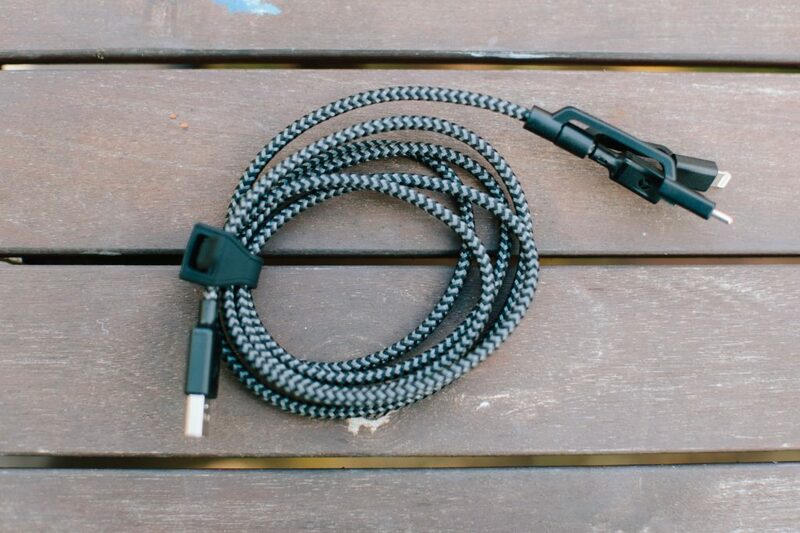 Look, you’re not going to find a better, more useful cable than this. 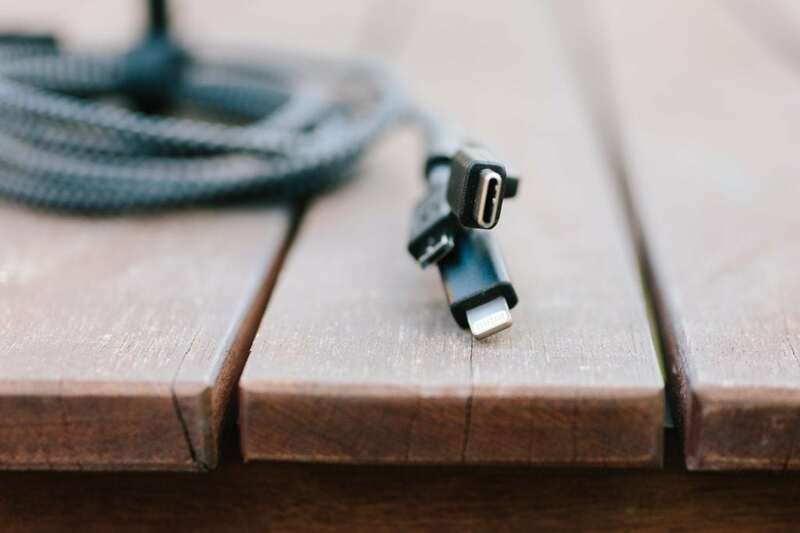 It’s the three cables you need rolled into a rugged, singular option, and it has a rubber tie to boot. It might be tough to swap the tips at first, but you’ll get the hang of it. 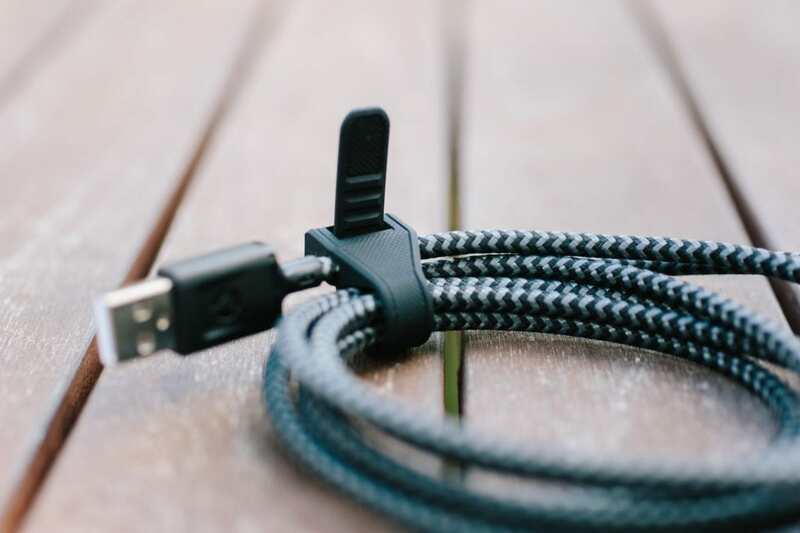 You might also think it’s a little expensive at $34.99, but that’s in line with getting three separate rugged versions of the singular cables. Imagine not having to pack three different cords with you for your next flight or road trip. As of writing this, though, it looks like NOMAD is sold out of the cable in their online store, so you’ll just have to keep checking back for availability. Previous Post REVIEW: The Amazon Echo Dot (2nd Generation) Is Neat… But Worth It?